It’s our go to, easy dinner especially when we want simple comfort food. 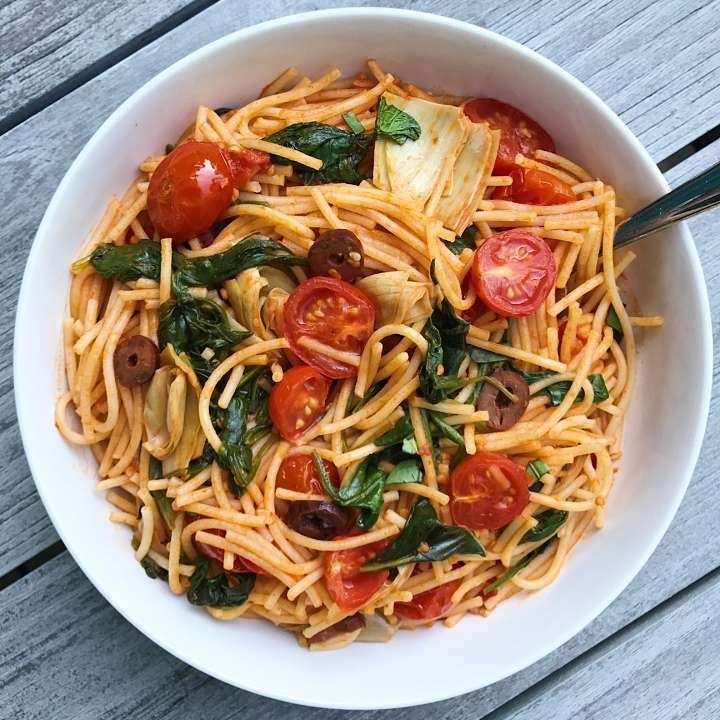 And this Mediterranean Veggie Pasta is a favorite because it comes together so quickly and is super flavorful, especially in the Summer and Fall when the produce is at its freshest. It’s simply cherry or grape tomatoes, marinated artichokes, kalamata olives, fresh spinach and fresh basil sautéed and cooked up veggie broth, garlic, salt, pepper, crushed pepper, tomato paste and gluten-free spaghetti. Here we used Barilla gluten-free spaghetti. 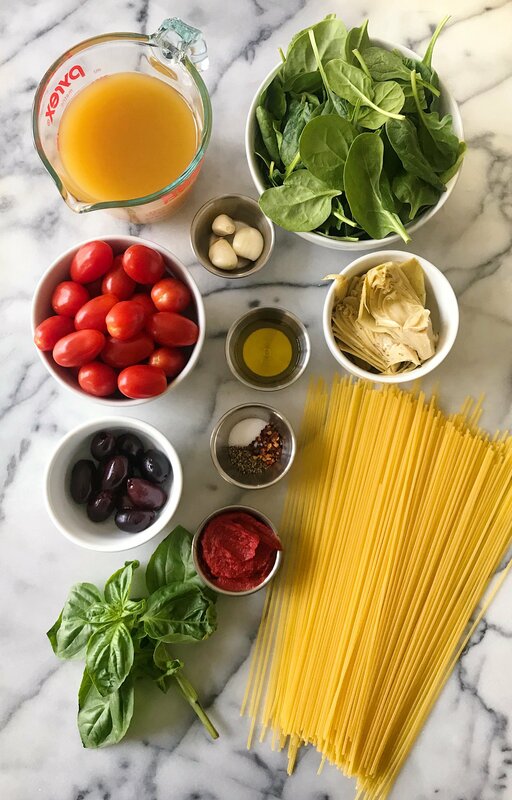 If you want to know more about our favorite Gluten-Free Pasta Brands, I wrote a blog post sharing them a few months ago. I’ve already mentioned how quick and easy it is but let me tell you how quick and easy. While the pasta cooks, you whip up the “sauce” by first sauteing garlic and crushed red pepper in olive oil, then stirring in the tomato paste. Next you add the tomatoes, broth artichokes and olives to simmer. When the pasta is al dente, you add it directly to the sauce to cook up for a minute and absorb the flavors, then add stir in the spinach and basil. When they wilt, the dish is ready to serve! Recipe adapted from Cooking Light, we make this dish often precisely because it takes less than 30 minutes start to finish, and we love that the pasta is added to the veggies and veggie broth for the last few minutes so it really absorbs all the flavors. I added artichokes and tomato paste to the original recipe. A simple, delicious and super quick pasta dish that is sure to be a favorite! Packed with all the best Mediterranean flavors. Serve as is or with parmesan, feta or ricotta salata. Recipe adapted from Cooking Light. 3-4 tbsp of tomato paste to the recipe. Bring a large saucepan of water to a boil (without salt ) . Add pasta; cook 8 minutes or until al dente. Reserve 1 cup pasta water then drain in a colander. Set aside. While pasta cooks, heat a large skillet over medium heat. Add oil to pan and swirl to coat. Add red pepper and garlic; sauté 30 seconds or until fragrant. Add tomato paste, stir over heat for about 1 minute. Add tomatoes, broth, salt, black pepper, artichokes and olives. Cook 5-7 minutes or until tomatoes begin to break down, stirring occasionally. Add pasta, and simmer 2 minutes. If need more liquid, add reserved pasta water, hot water or more broth as desired. Stir in spinach and basil; cook 2 minutes or until greens wilt. Top with cheese if desired. Enjoy! Great recipe, I am going to add broth after I saute the vegtables first, to give it that roasted taste. Tks looks yummy. Great idea! Let me know how you like it!